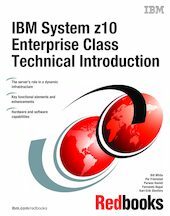 This IBM Redbooks publication introduces the IBM System z10 Enterprise Class server, which is based on z/Architecture®. It builds on the inherent strengths of the System z platform, delivering new technologies and virtualization that are designed to offer improvements in price and performance for key workloads, as well as enabling a new range of solutions. The z10 EC™ further extends System z's leadership in key capabilities with the delivery of expanded scalability for growth and large-scale consolidation, availability to help reduce risk and improve flexibility to respond to changing business requirements, and improved security. The z10 EC is at the core of the enhanced System z platform that is designed to deliver technologies that businesses need today along with a foundation to drive future business growth. This document provides basic information about z10 EC capabilities, hardware functions and features, and associated software support. It is intended for IT managers, architects, consultants, and anyone else who wants to understand the new elements of the z10 EC. The changes in this third edition are based on the IBM Hardware Announcement, dated October 20, 2009. This book is intended as an introduction to the z10 EC mainframe. Readers are not expected to be generally familiar with current IBM System z technology and terminology.